This photograph of Bayside was recently acquired online by Potsdam Museum staff member Tom Dashnaw, who shared it with us. 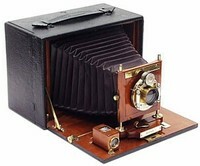 Tom learned that it was taken by Robert “R.J.” Stead, a Canadian photographer out of Lanark Village, near Smith Falls, Ontario, from the 1870s until the turn of the century. Stead crossed the border to take a number of stereoviews under the “Views of St. Lawrence Co., N.Y.” imprint, but his more lucrative trade was in the spring when lumber camps broke up and the lumberjacks commissioned their portraits taken before heading home. 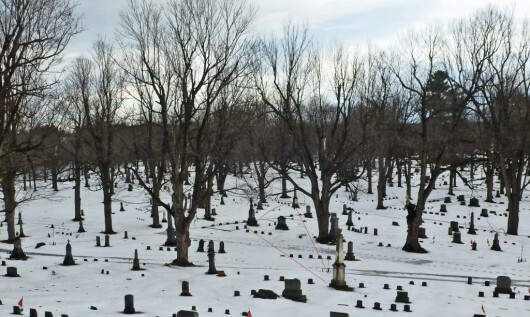 Tom has established that this view, looking southeast from the high hill in the middle of the burial ground, lines up fairly well with the contemporary photograph, taken in 2016, below. Based on the dates of the monuments in the photo and not yet in the photo, Tom estimates that this photo was taken between 1883 and 1887, about twenty years after the cemetery was constructed. 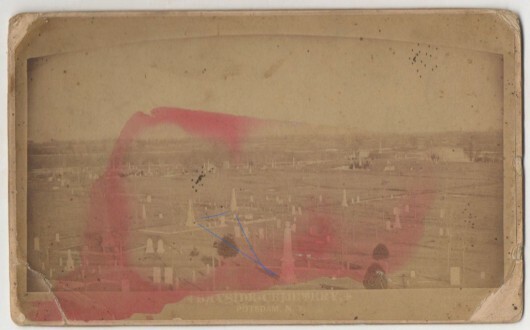 The triangulation of monuments in blue line in the old photo line up with the red line in the contemporary photo.